If there’s one franchise that doesn’t need any introduction whatsoever, it has to be Ghostbusters. Quite simply one of the most iconic movies of all time, which quickly (and unsurprisingly) went on to be transformed into all manner of games, toys and just about everything else imaginable. 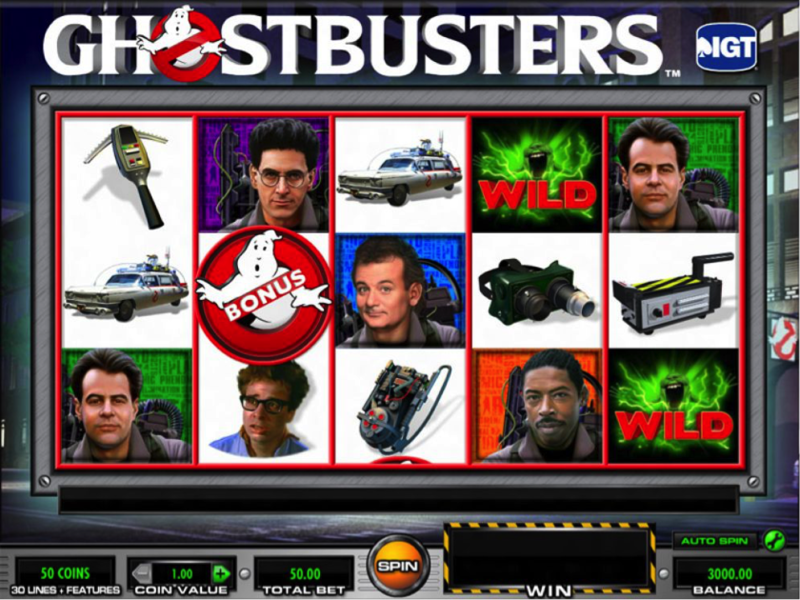 Some were of course better than others, but what about the two most popular Ghostbusters online slots? The first of the two Ghostbusters slots we’ve put under the microscope comes from IGT and is called, quite simply, Ghostbusters. There are five reels and a total of 30 paylines to play for, along with four mystery features that can be triggered at any time during normal play. Just for the record, this is more generous than pretty much any other comparable slot out there. First of all, there is a cash Award Feature which involves Slimer going slightly insane and giving you anything from 50 to 1,000 coins. Then there’s the multiplier feature, which when active sees a multiplier of 2X to 5X added to any winning combinations. Enjoyable enough, but neither of these two has a tendency to pay out anything particularly big. Next up comes the extra wilds feature, which sees anything from 1 to 4 additional wild symbols appear in random positions – prices going up to around 30X your bet. Last but not least, the wild reels feature sees between one and three of the reels turned fully wild. For obvious reasons, this presents the most plausible prospect of plentiful prizes being pocketed. So the base game features are not particularly generous, but enjoyable. However, there are two primary features that take available prizes to a much higher level. One of which being the Ballroom Busters Bonus feature – land at least two bonus symbols and you get the opportunity to take aim and fire at six ghosts. Depending on which ones and how many you hit, you’ll be handed a cash prize with a multiplier worth up to 5X. And then of course there’s the legendary Stay Puft Bonus feature, which can be triggered once again by landing two bonus symbols and the Stay Puft bonus symbol at the same time. A total of eight free games are handed out, though with the added bonus of a full 40 paylines to play for. When marshmallow symbols appear on the reels, they act as wilds and stay in place for the rest of the bonus round. There are some big prizes to be won, though with the one slight downside of not being able to retrigger the free spins at anytime. With an abundance of video clips from the movie, all the characters you love and a huge variety of bonuses to play for, it’s impossible not to have a good time with Ghostbusters. With this quantity of bonus features available, it’s inevitable that prize payouts are going to be somewhat on the modest side to say the least. Nevertheless, if you are the kind of slot gamer who plays for pure enjoyment over and above life changing sums of money, you’ll probably find everything you could ever ask for in Ghostbusters. Next up, IGT once again serves up the goods for Ghostbusters Triple Slime, though in this instance they do appear to have high-rollers in mind. The reason being that while spins are available from as little as 50p, there’s also the option of spending up to £1,500 per spin. Not that you’re likely to ever do so, but still…high hopes on the part of IGT it seems! Once again, they’ve hit the nail on the head with Ghostbusters Triple Slime when it comes to presentation, animations, sound effects and so on. All the symbols you’d expect to make an appearance are present and correct, the wild symbol check for former of Stay Puft and there are two scatters doing the rounds. Though it takes a little getting used to, Ghostbusters Triple Slime uses the MultiWay Xtra engine, which basically means that winning combinations can be formed with symbols all over the place and in both directions. Land three or more Slimer scatter symbols and you’ll be transported over to the bonus round with the same name. Depending on where you landed the scatters to access the feature in the first place will determine the prizes on offer – anywhere from 10 to 2,000 coins. However, if you enter the round with a full five scatters, there’s a top prize of 3,750 coins available. After this comes the triple slime bonus feature, for which you will need to land at least three or more bonus symbols. Things then get a little on the complicated side with a handful of coloured wheel pointers, where you’ll get the opportunity to choose a number of ghosts in accordance with how many bonus symbols you landed. Prizes vary from 100X to 250X your coin value. So there’s plenty to play for in terms of both enjoyment and prizes alike. 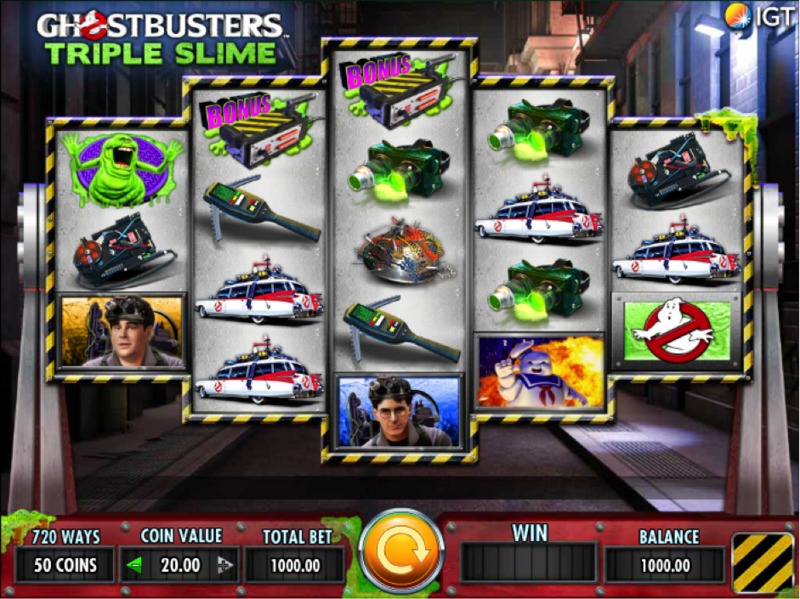 The only slight downside with Ghostbusters Triple Slime being that for some reason, IGT decided not to include any kind of free spins bonus feature. Variance is somewhere around the mid-level, which means that while long dry spells aren’t common, neither are hefty prize payouts. On the whole therefore, it’s easy to see that while the vast majority of Ghostbusters fans have plenty of love for both slots, the original is generally considered the best. As is the case with most classic movies, when you think about it!